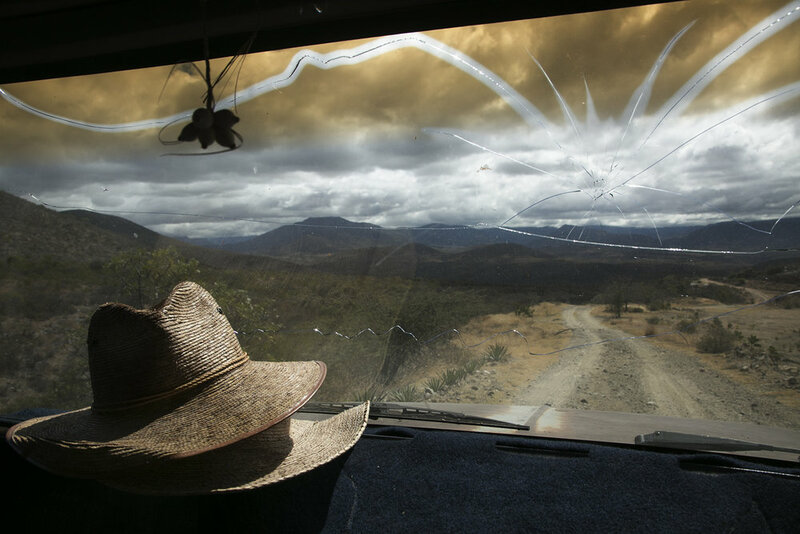 Augustin Guendulain's windshield is cracked from an accident while driving after drinking too much mezcal. It is an imprint of his friend's head. Read more on National Geographic and on Roads and Kingdoms. Also Published in Slate and on Anthony Bourdain: Explore Parts Unknown. Pedro Reyes wipes sweat from his brow after a day of harvesting agave near Mihuatlan, Oaxaca. Dia de los Muertos party, San Miguel Allende, Guanajuato. 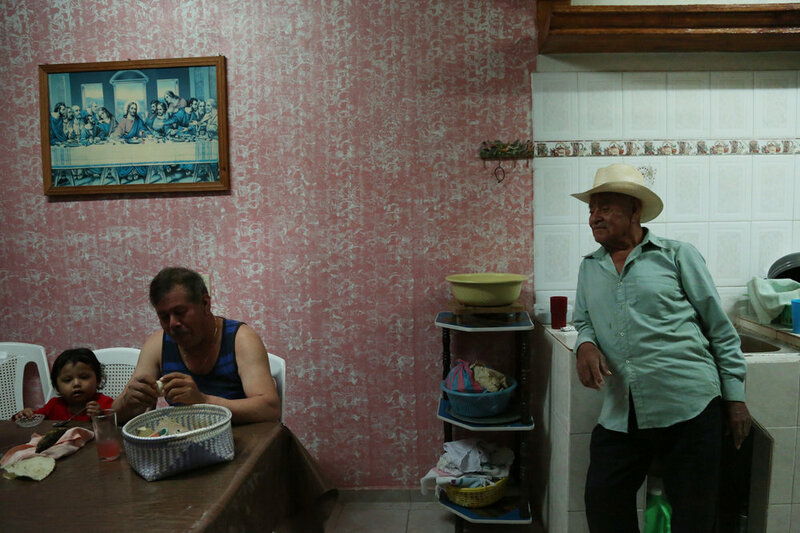 Fortunato Angeles and his brother-in-law, Raul Marin, eat pozole and fresh tortillas after a day at the palenque in San Juan del Rio, Oaxaca. Augustin Guendulian harvests agaves in his field near Mihuatlan, Oaxaca. Day laborers walk to work in San Miguel Allende, Oaxaca. A shot of mezcal after day working of harvesting wild agave in Mihuatlan, Oaxaca. Sipping mezcal at a private party in Mexico City. Teresa Raymundo cooks stew at her home in San Juan del Rio, Oaxaca. Augustin Guendulain and Pedro Reyes rest near a shrine while harvesting agave near Amatlan, Oaxaca. Party-goers drink Mezcal Amores at an exclusive pop-up gallery event in Mexico City. Fortunate Angeles wipes his brow after breaking up roasted agave to prepare it for milling at his palenque in San Juan del Rio, Oaxaca. Arnulfo de los Angeles and Rodolfo Hernandez sit at the palenque that they share with Fortunate Angeles in San Juan del Rio, Oaxaca. Teresa Raymundo carries flowers to a funeral in San Juan del Rio, Oaxaca. Fortunato Angeles rests on a fermentation tank at his palenque in San Juan del Rio, Oaxaca. Adalbert Bravo tours construction of a new palenque he's building where maestro mezcalero Fernando Lecama will produce for Huichichique mezcal. Atlixo, Puebla. 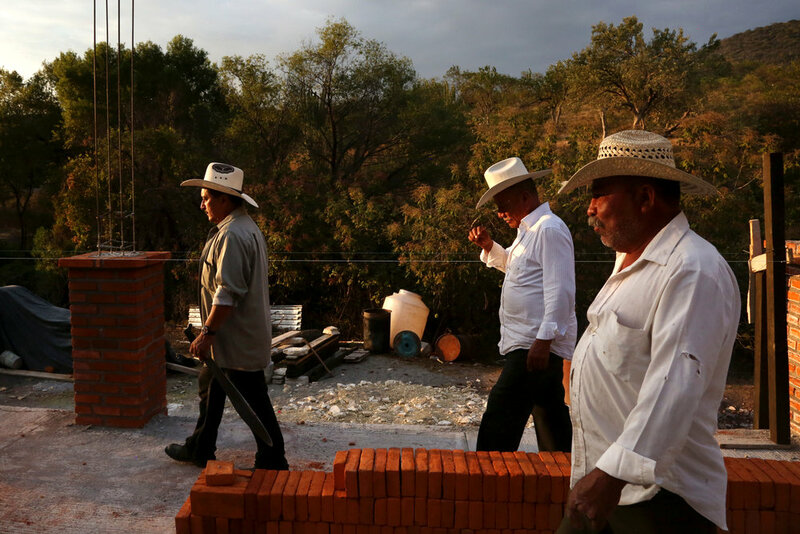 A team from Mezcal Amores tours the construction of a new facility for research and production of their Verde line in Tlacolula, Oaxaca. Tourists from Guadalajara sample mezcals at Mezcalilira in Oaxaca City, Oaxaca. Fortunato Angeles rests at his palenque in San Juan del Rio, Oaxaca. Mezcaleros walk through a palenque in construction in Atlixo, Puebla. The church in San Juan del Rio, Oaxaca was built in the early 1800's. Empty shot glasses, beer, flowers and a couple at a private party in Mexico City. A wild agave grows near Atlixo, Puebla.